When customers first enable your Alexa skill, they expect a seamless and personalized experience. 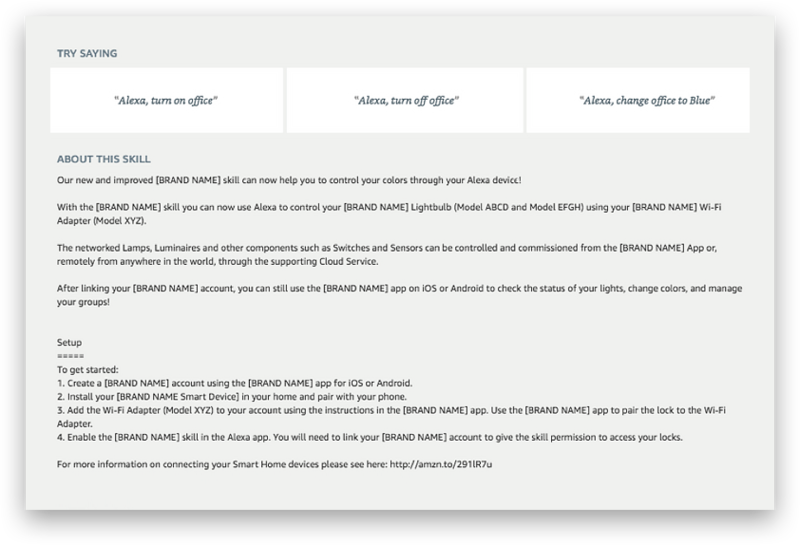 Some Alexa skills require account linking to associate the customer with a user account or device. While account linking can be a complex feature to implement in your skill, it’s critical that it’s done well to create a positive customer experience. We shared our top tips for account linking in a previous post, in which we covered some basic best practices to ensure a high-quality account linking experience. As we analyze more customer reviews and feedback for Alexa skills, we’ve uncovered more trends in account linking. Here we dive into six additional best practices that go beyond the basics to help you provide your customers with a seamless linking experience. New customers, especially those with no account or device setup for a skill that requires account linking, can benefit from clear and concise instructions for how to get started. The skill description and account linking pages are two key places where customers will go to obtain information about your skill and how to link their account. Customers may try to enter the account linking process from every branded service that you offer, and considerations should be made for each account type you support. Accounts that are not intended for your skill or cannot support skill services should not succeed in the account linking flow. When customers can create branded accounts, which are not intended to be used with the skill, it’s best to provide clear messaging to the customers on these account creation pages that the accounts cannot be used with the skill’s account linking. In cases where maintenance is required to merge existing authentication and authorization databases, minimize disruption to new and existing customers by conducting maintenance during off-peak hours. If needed, explicitly state in the account linking page which accounts should be used with the newly merged databases. 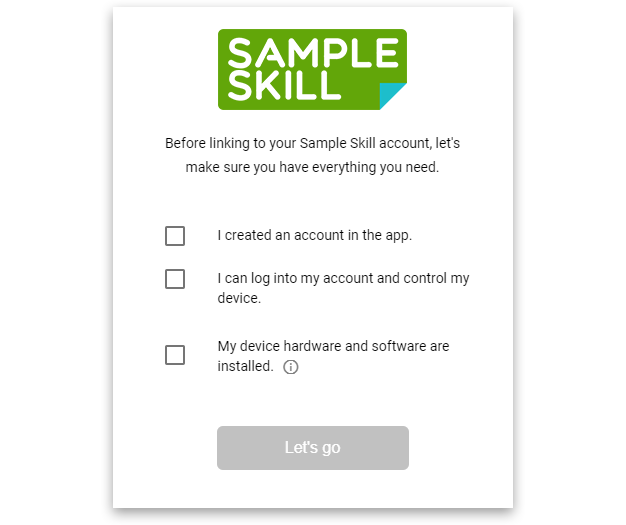 For example, if accounts are meant to be created in your companion app, or your skill is intended to be used with smart home devices, then the skill description and account linking pages should direct customers to this app for device pairing and account creation. The skill description page should explicitly state which accounts are supported and how the customer can create those accounts. 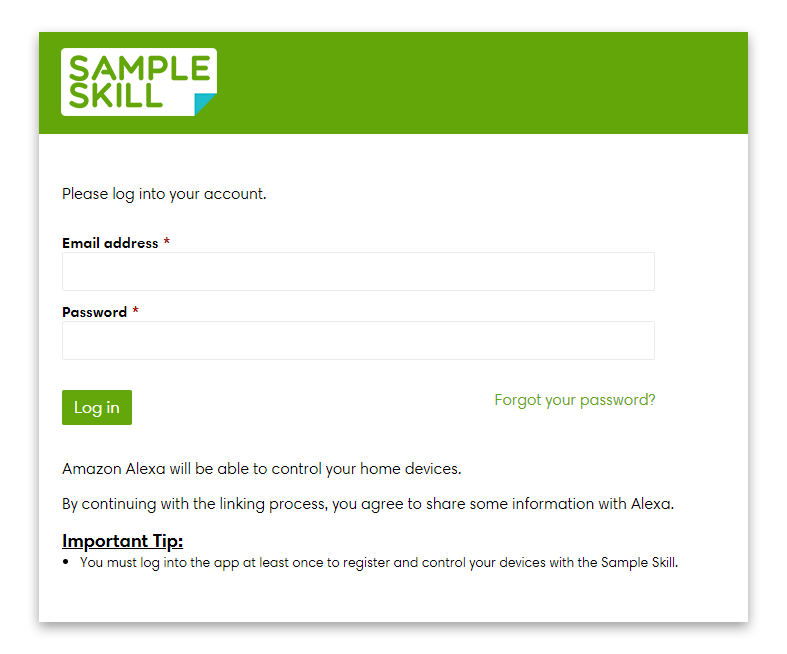 The customer may not realize that the Alexa skill or your companion app exist, or that specific hardware is required to use the skill. If your skill supports multiple countries and territories, ensure that the account linking page allows the customer to log in with an account created from any of those supported locations. This ensures that your skills’ authentication database will not become segregated by region and users will not unexpectedly fail to log in with their German account if the user has unknowingly arrived at or been redirected to the US login page. Ideally, there should be a single shared global database for all accounts supported by your skill. If this is not possible, another option is to detect the user’s locale by utilizing the accept-user language field to help determine the customer’s region, and then redirect the user to the correct region’s authorization URL. The goal is to create a seamless experience for the customer in which they can link to your skill with an account from any region in the world without any issues or additional steps required. In any of the mentioned cases above, errors may happen during the account linking process and customers may need to contact you for assistance. When errors do occur during account login, the message conveyed to the customer should be clear as to why the account linking process failed. For example, provide a clarifying message to the customer that the account is not intended to be used with skills and directions for the customer on how to create the correct account. In cases where the customer is using the correct account but having difficulties with credentials, the skill should provide a way for users to retrieve their username or reset their password. The skill should provide clear guidance for the customer in the skill description and account linking flow on how to resolve any issues they encounter and how to get help if needed. When customers enable skills that require account linking, they are immediately redirected to your login page to complete the linking process. However, the customer may not complete the account linking process in that instance. Customers may be confused by what to do on this page, may choose to link later, or there may have been an error during account linking. To uncover any areas of customer friction or issues in the linking process, you should be tracking metrics to conduct funnel analysis for your account linking flow. Track metrics for each of the account linking steps, such as the number of users arriving at the landing page, device or PIN selection, or completion of the token exchange. In addition, funnel analysis should be possible for all available flows, such as account creation, password recovery, and alternative login flows, such as Twitter, Facebook, or mobile login. Use these insights to improve the overall customer experience during the account linking process.